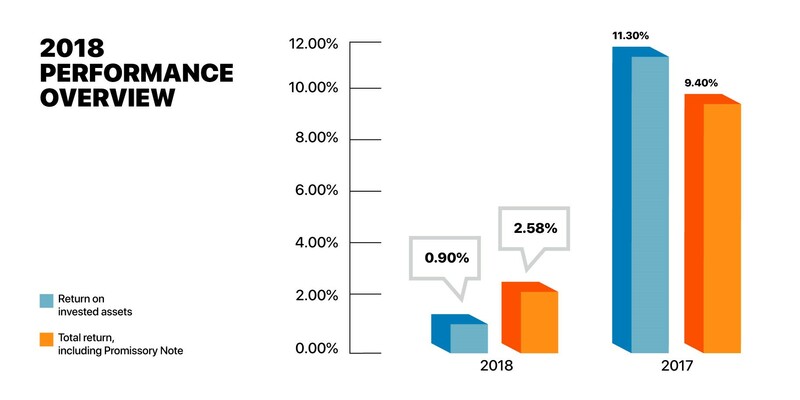 During 2018, the Plan achieved a return on invested assets of 0.90% gross of investment management fees (0.40% net of investment management fees). These return figures only reflect the Plan’s invested assets and do not incorporate the $1.8 billion promissory note received from the Government of Newfoundland and Labrador. The promissory note bears interest at a rate of 6% per annum and is a further fixed income investment of the Plan. Through the pension reform process, a primary objective of the establishment of the promissory note was to stabilize the Plan’s returns. When considering the impact of the promissory note during 2018, the return increases to 2.58% gross of investment management fees (2.25% net of investment management fees), which clearly illustrates the stabilizing effect of the promissory note. Total invested assets were consistent with the prior year at approximately $3.4 billion. In addition to comparing performance against the Plan’s assumed actuarial discount rate of 6%, the TPPC also compares its performance against relative benchmarks on a total-fund and individual asset class basis. This benchmarking process is critical as it allows TPPC Management, members of the Investment Committee and Board of Directors to evaluate the effectiveness of the Plan’s investment strategy and implementation. TPPC’s benchmarks are approved by TPPC’s Board of Directors, with the input of TPPC’s investment team and investment consultant. On a total-fund basis and for each asset class, the Fund seeks to outperform the benchmark rates of return, and this outperformance is described as “value-add”. A discussion of the Plan’s performance will always be anchored back to a comparison to the assumed actuarial discount rate and the Plan’s established policy benchmarks. Although the Plan’s return for 2018 lagged the discount rate of 6%, the gross return on invested asset of 0.90% exceeded the Plan’s policy benchmark of -0.01%, representing a value-added return of 0.91%. For 2017, the Plan’s policy benchmark was 9.70% which reflected a value-added return of 1.60%. The value-added return stems from the active management undertaken by the Plan’s investment managers.